The famed Austrian geologist Eduard Suess first introduced the concept of the biosphere in 1875, using it to refer to the “place on the Earth’s surface where life dwells.” This concept was built upon and very significantly expanded by the Russian mineralogist-geochemist Vladimir Vernadsky, who defined it in terms that combined elements of geology, chemistry, and biology in his 1926 book La biosphere. Vernadsky envisioned that the biosphere contained two types of matter: living matter in all its forms and “inert” (nonliving) matter, such as minerals, which were preserved over time. Vernadsky argued that just as nonliving matter was transformed by living organisms, the biosphere was transformed by human cognition, and that life and human cognition were essential components in the evolution of the Earth. The contemporary concept of the biosphere is the space on or near the earth’s surface that contains or supports living organisms as well as dead matter produced by living organisms. The biosphere is a core concept in ecology and biology; it represents the highest level of biological organization and includes all biodiversity on Earth, from simple molecules to structures within a cell (organelles), organisms, populations, communities, and terrestrial and aquatic ecosystems. Certain environmental conditions must be met for organisms to live, including the proper temperature and moisture, but in addition, they require energy and nutrition. Nutrients are contained in dead organisms or in the waste products of living cells and are recycled and transformed into compounds that other organisms can use as food. Vernadsky was the first scientist to recognize that the oxygen, nitrogen, and carbon dioxide present in the Earth’s atmosphere was the result of biological processes. The biosphere has evolved since the initial appearance of the first single-celled organism some 3.9 billion years ago, at a time when the carbon dioxide-rich atmospheric conditions resembled that of our celestial neighbors, Venus and Mars. The plants caused a breakdown and release of oxygen from the carbon dioxide, giving rise to an oxygen-rich (O2) atmosphere for breathing and stratospheric ozone (O3), which protects the Earth’s inhabitants against ultraviolet radiation. SEE ALSO: Origin of Life (c. 4 Billion BCE), Prokaryotes (c. 3.9 Billion BCE), Land Plants (c. 450 Million BCE), Plant Nutrition (1840), Photosynthesis (1845), Ecological Interactions (1859), Global Warming (1896). 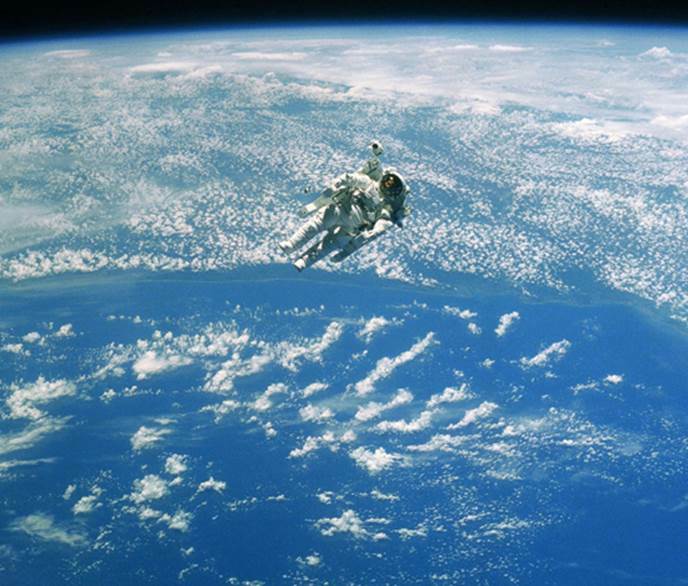 Miles above Earth’s biosphere, astronaut Robert C. Stewart tests a hand-controlled manned maneuvering unit, which allows astronauts to move freely in space without a tether, during the 1984 flight of the space shuttle Challenger.